Welcome to Boiler Services Dublin the counties leading independent power flushing and radiator repair experts. Our company has been trading in Dublin for over 40 years. We have proved ourselves to be industry experts in anything to do with Boilers and central heating systems. This includes power flushing, radiator repair, boiler servicing, repair and replacement. Power flushing cleans your central heating system, a technician will firstly drain your boiler, pipes and radiators of all water. The technician will then attach the power flushing machine and add a cleaning chemical.The system will then be flushed. Finally a corrosion inhibitor will be added to prevent any corrosion to your heating system. 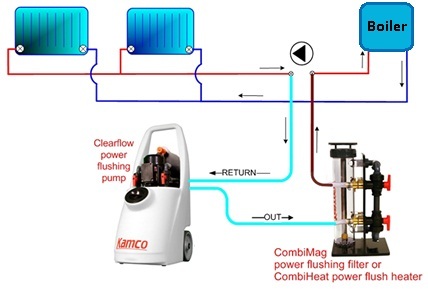 When would I need power flushing on my central heating system? If you were having a new boiler system installed it is highly important. This will prevent any future problems. Boiler manufacturers now say you must have your system power flushed otherwise your boiler warranty becomes invalid. This is because a lot of heating systems are found to have corrosion and sludge even though there has yet to be any signs shown. If your boiler has started to make peculiar noises. This can be a sign that the heat exchange has a build up of sludge. If you find that your central heating system is taking an age to heat up. If you are finding a number of cold spots in your radiators. this is caused by a build up of sludge in the heat exchange. Your water pump is regularly failing. your radiators are leaking form pin holing in the radiator body. You regularly need to bleed your radiators. This is all part of your central heating maintenance. Our power flushing service is normally conducted over 2 visits. First we send a senior boiler services technician to evaluate your system and requirements. Then the installation visit. Once the process is started it can take from 4-6 hours to complete. We will cause as little disruption as possible and can arrange a time that suits the clients. This could be early mornings or weekends at no extra cost. Your heating system will become far more efficient on completion. This is due to all the build up of dirt and sludge being removed. Boiler Services Dublin offer power flushing from €450 ex V.A.T this is over €150 cheaper than Bord Gais. We are industry experts in all heating systems. All of our technicians are fully qualified plumbers with R.G.I. registration. All of our work is 100% guaranteed and we are fully covered by both public and professional indemnity insurance. Call the experts today on 01-8326699 to arrange to have your central heating power flushed.